24-hour forecast: Cloudy spells today and partly cloudy tonight. A few showers and isolated thunderstorms will develop mostly over the south and coast this morning then mainly over inland areas this afternoon and southern areas tonight. General Outlook: For Wednesday and Wednesday night is for a decrease in showers and thunderstorms. Today E 5-15 kts Light Chop-Choppy 2-4 ft A FEW SHOWERS AND ISOLATED THUNDERSTORMS MOSTLY MORNING. Tonight E 10-20 kts Choppy-Moderate 3-5 ft A FEW SHOWERS AND ISOLATED THUNDERSTORMS MAINLY SOUTH. Tomorrow E 10-20 kts Choppy-Moderate 3-5 ft A FEW SHOWERS OR ISOLATED THUNDERSTORMS DECREASING. Outlook E 10-20 kts Choppy-Moderate 3-5 ft A FEW SHOWERS OR ISOLATED THUNDERSTORMS SOUTH. Two tropical waves are moving across the basin. An upper low centered over central Cuba near 20N81W, along with abundant tropical moisture, is inducing scattered showers across Cuba. 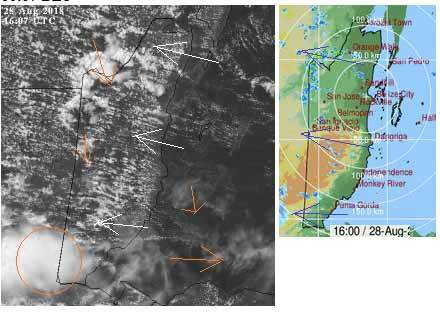 Convective activity will gradually shift westward as the upper low tracks moves to the W.
The eastern part of the eastern Pacific monsoon trough stretches across Panama to Colombia. Scattered showers and thunderstorms are south of 14N between 79W-86W. Fresh to strong winds and building seas to 10 feet will continue in the south-central Caribbean Sea through Wed. A tropical wave along 66W will bring fresh easterly winds and build seas to 7-8 ft as it moves across the basin. 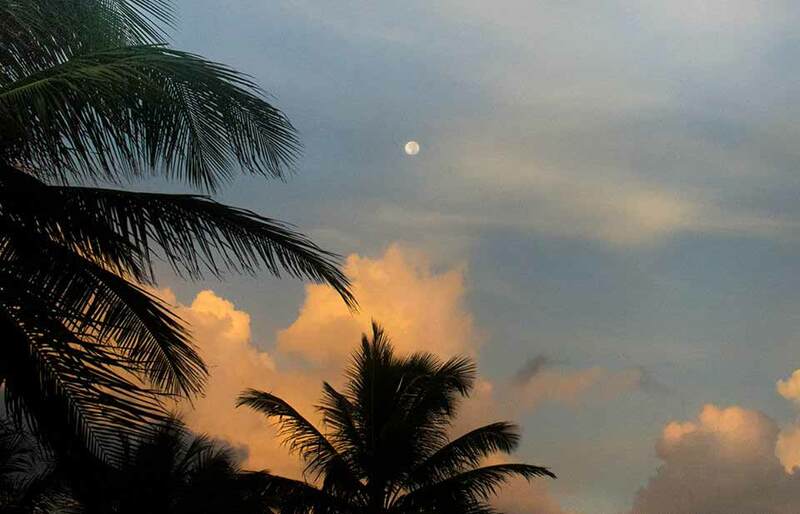 Another wave will enter the eastern Caribbean on Wed, increasing the likelihood of scattered showers and thunderstorms over much of the Lesser Antilles. On Ambergris Caye this morning the wind is from the East at 10 mph and the sea around our barrier reef is choppy. It's a sunny morning with blue sky. 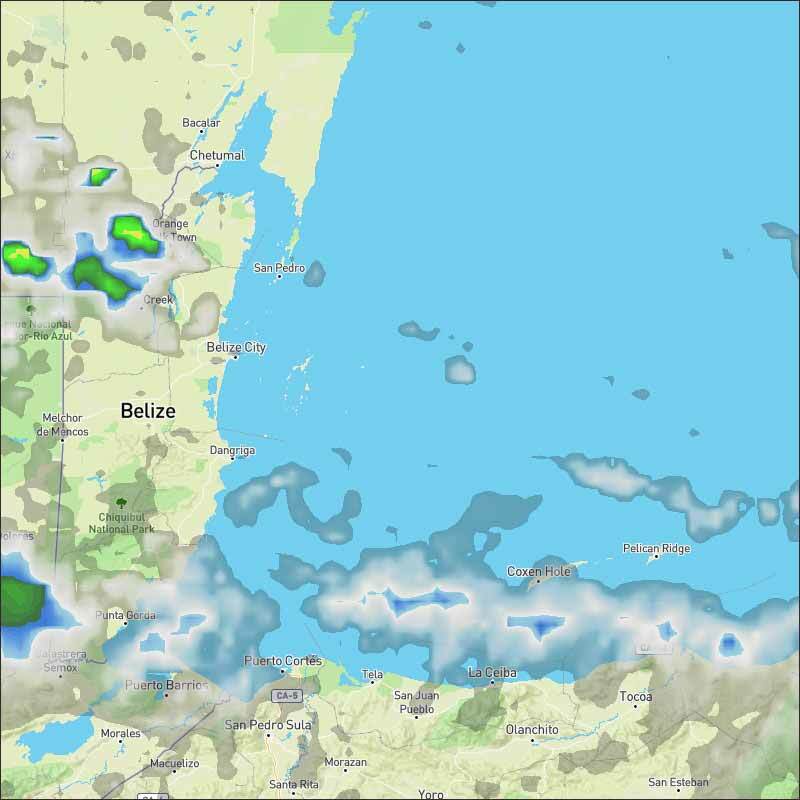 The expected high temperature today is 88 f.
There are strings of chunky Caribbean cloud around, causing scattered rain showers in any part of Belize this morning, but there is a swell up causing heavier rain over the PG area right now. There is thin high level cloud coving over from the WNW. Looks like today will be mainly sunny, with chunks of cloud developing and scattered small rain showers.